Hurricane Wilma and 120 mph winds were no match for Naples Philharmonic Center for the Arts' FiberTite roof. There is nothing quite like a Florida Hurricane to test the stamina of a roofing system. In October of 2005, when the people of Naples, Florida found themselves staring Hurricane Wilma right in the Eye, those at the Naples Philharmonic Center for the Arts held their breath. Just a few months earlier they had finished installing a new roof on the center. A Category 5 hurricane, Wilma set historical records as she forged her path from the Caribbean to the U.S. She blew through Naples at 120 mph and caused over $20 billion in damages in the U.S., ranking her among the top three most costly U.S. storms. Wilma became known as the most intense storm ever to travel the Atlantic Basin. Luck is involved in beating a storm like that, but it also requires wisdom. 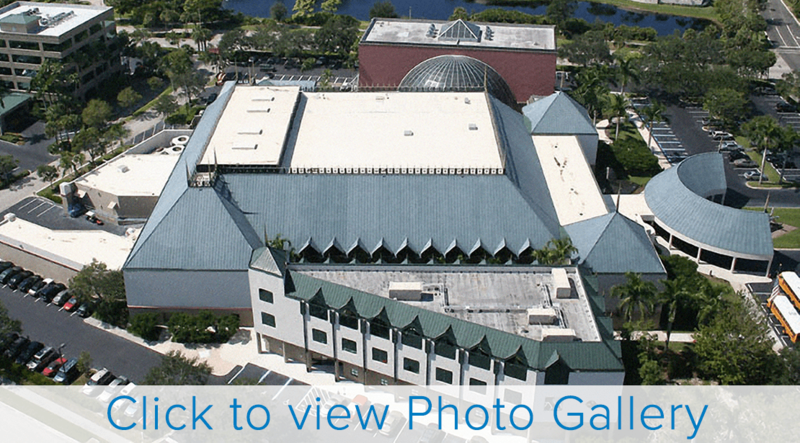 Decision makers at the Naples Philharmonic Center for the Arts - a landmark building in Naples - had considered potential tropical disasters like Wilma when they selected a FiberTite mechanically attached roofing system for their facility. The FiberTite roof replaced an old smooth modified system that was hot mopped over a nailed base sheet. The decision to choose FiberTite stemmed from a desire to work with a roofing manufacturer to custom design a system that would withstand the rigors of the southwest Florida climate. Among other top priorities were the system's ability to resist serious wind uplift; energy savings in the face of Florida's intense heat; and, a proven track record of beating Florida's storms. The Naples Philharmonic Center for the Arts is home to the Philharmonic Orchestra and the Naples Museum of Art. The Center hosts more than 400 cultural events each year, including opera, dance, classical and popular music and Broadway musicals and seats 1,400 guests. The Center also houses four museum-quality art galleries where world-class painting, sculpture, drawing and other art forms are displayed. Since introduced on rooftops in Florida back in 1979, over 99% of FiberTite roofing systems ever installed across the U.S. are still protecting.